The shoulder joint is a synovial multi-axial spheroidal joint. It occurs between the roughly hemispherical head of the humerus and the shallow glenoid fossa of the scapula. Since there is no major bony constraint, the joint has 3 degrees of freedom. It is the most mobile joint of the body and allows all the movements shown above. 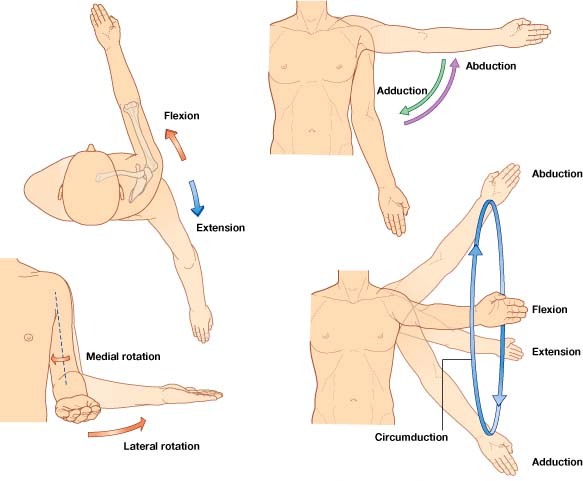 The stability of the joint depends on the surrounding muscular and soft tissue envelope. It is one of the most frequently dislocated joints in the body.